The Smeltery Controller is a machine added by Tinkers' Construct. Made from Seared Brick, it provides the interface for the Smeltery multiblock structure. The left most grid is for placing smeltable items into the smeltery, such as ores or ingots. 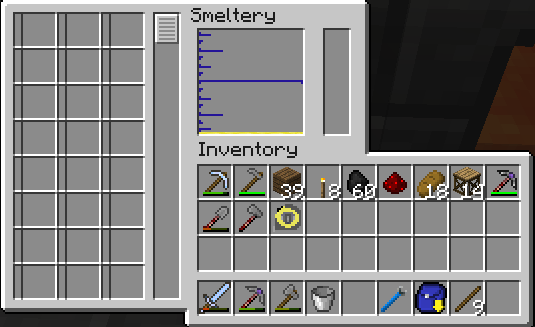 The amount of items that can be held depends on how tall (or wide) the smeltery is. The middle gauge shows how molten liquid is in the smeltery. Different liquids can exist in the smeltery at the same time. The taller the smeltery the greater its capacity. The right meter shows how much lava is currently (you can use Blazing Pyrotheum to melt ores faster) in the smeltery. If using multiple Seared Tanks it may not always calculate the available lava correctly. This page was last modified on 28 April 2017, at 20:21.